Navigating the path to college can be daunting for all high school students and their families, but it can be especially arduous for low-income and first-generation students. Waukegan to College, a local non-profit operating out of the Christ Episcopal Church in Waukegan, is removing barriers and helping these students successfully find their way to college. Waukegan to College was founded because of community concerns that the public education system was not adequately preparing students for or guiding them toward a four-year college degree. So, in 2009, W2C began working on its mission to create brighter futures for Waukegan students, families and the community by helping students prepare to enroll in and graduate from college. Waukegan to College has had many successes. It has grown from 25 to more than 156 students participating in its program, and its students are outpacing their peers, with a 90 percent college-readiness rate compared to 18 percent within the school district. Since 2010, all W2C’s high school seniors have matriculated to college. Now in its 10th year, Waukegan to College is looking to multiply those successes by the Power of Ten to serve significantly more students and families. One of the ways Waukegan to College plans to achieve its Power of Ten goal is through its new Parents Educating Parents network, where trained parent mentors lead workshops designed to teach other parents about the college-readiness process based on the age of their children. Parents Educating Parents is a four-part plan that details a road map to college from elementary to high school. The workshops are: Early Age Success for parents of elementary-aged students; High School Options and Transition for middle-school parents; Four-Year Plan for parents of eighth graders and high school students; and Going to College for junior and senior families. W2C offers these workshops at the Waukegan Public Library, local churches, soccer clubs and other community organizations in order to reach more students and families than it currently serves. 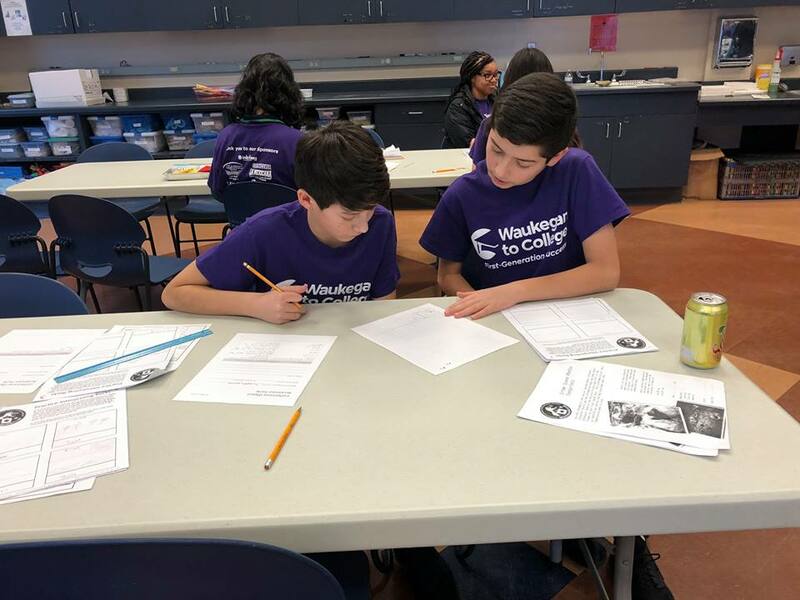 In addition to the workshops, Waukegan to College continues to offer its core services such as subject-specific tutoring on Saturdays; math and reading enrichment; whole family academic and guidance counseling; summer enrichment; parent leadership; peer mentoring; monthly mentoring o the college selection and scholarship application process; and graduatio coaches. Waukegan to College is tearing down academic and information barriers to college entry for its students and families. College is now an attainable option for an increasing number of Waukegan youth who desire to be on their way to first-generation success. W2C hopes to build upon this momentum and extend its outreach by the Power of Ten to help hundreds, if not thousands, of Waukegan students reach their potential. W2C has greatly impacted the lives of three generations of the Gaytan family. “My husband and I gave up everything—our home, our business, our friends and relatives—to bring our family to the United States. This ultimate sacrifice was for one reason and one reason only: so that my children and grandchildren could get the best possible education,” said Aurora Gaytan.